When playing Melee on console, the ranges of picture quality and lag you can achieve are very wide. This thread is aimed at everybody who cares about playing in high picture quality, near-zero lag (sub-millisecond) and without spending a fortune. 5a gives you 480p60-YPbPr, which is hard to make use of directly. If you have a non-laggy CRT that supports it (for example the Sony PVMs listed below), you can use these just fine. Otherwise, you have to use conversion devices to convert to either RGBHV (“VGA”, near-lagless) or HDMI (conversion has a little lag; too little to notice for most players and too little to mess up timings if using the correct LCD (BenQ RL2455HM)). 6 requires the NGC DAC cables, which have a Macronix chip inside that can be switched into RGBHV mode so that they output that instead of YPbPr. You need to mod them by soldering some pins differently and exchanging the connector for DSUB/VGA (or 5 BNC / cinch cables if that suits your device input better). A guide how to do this can be found here. Doing so makes them compatible with PC monitors that have RGBHV inputs of some kind (VGA/DSUB, DVI-A, 5 BNC, 5 cinch etc.). This option is obviously not available for Wiis, only for Gamecubes. Additionally, PAL Melee is not able to be output as 480p directly, you will need a custom loader like Swiss or Qoob Pro to allow forcing it to 480p. Gamecube DAC cables usually go for 120$ on Ebay, so unfortunately it’s unlikely you can cheap out by using these cables with the abundant CRT PC monitors. If you look around, you might be able to locate collectors selling off their DAC cables for a much lower price. I personally bought 7 of them for just 150€, and at another time one of these cables together with 2 Gamecubes and 3 official controllers and lots of other stuff for only 100€. Altogether, option 5 is the one to go for, unless you feel like spending lots of money on Gamecube DAC cables. By testing, comparing and inspecting many different combinations of video cables, video equipment and monitors, this is the setup that I recommend the most to everybody, taking both price and picture quality into account (for different VGA output options, see this post). Connections are listed from closest to Wii to closest to monitor. The basic principle here is: Output YPbPr 480p from a Wii, convert (transcode) it to RGBHV (see this post for an explanation for why that's necessary), possibly clean and distribution-amplify the RGBHV (VGA) signal, and finally output it to the CRT monitors. Buy used for 1-5$, cheap ones from AliExpress or Ebay usually have bad picture quality Use any cheap decent quality VGA cable to connect the VGA005 to the VGA CRT monitor. Used is fine too. Ebay ~30$ usually This device cleans the VGA005 sync levels so that its video is recognized by capture cards and distribution amplifiers. If you only want to play on one CRT without recording or streaming, you don't need this. You'll also need one 5BNC to VGA cable. 2-output AliExpress 10$, 4-output AliExpress 12$ You need this to output to both monitor and capture card, and/or to multiple monitors. If you only need two outputs, with some RGB interfaces you don't need this. Professional Video Monitors have speakers and great tubes strong in brightness and color accuracy. If you can find one for a cheap price, they are probably the best monitor for console Melee. Drawbacks and reasons why I don't recommend them foremost are that only a few of them support 480p, they are very expensive compared to PC monitors, and they are not as compatible with Faster Melee use. These have component inputs and support 480p. However, very little information about them is available, and to my knowledge they haven't been tested for input lag properly. Untested EDTVs should be avoided or at least play-tested at the seller's place before buying. Many of the EDTV CRTs have to be expected to lag 8-30 ms, which is borderline to completely unplayable. With more expensive adapters, it's probably faster. Also, when used with a Faster Melee setup, it was roughly 6ms slower when set to 120Hz than a 120Hz CRT used with exactly the same hardware. These monitors have been tested by many people and so far, to my knowledge all of them have reported them to be fine for tournament play. However, this does not mean that every gaming LCD advertised with "1 ms response time" is equally fast. The BenQ XL2720Z, for example, was measured by prad to have 7.7 ms input lag, even though it's listed as "1 ms response time". For gaming LCDs, only those models that have been proven to have below 5 ms input lag should be considered perfectly fine for tournament play, in my opinion. For recording 480p60 Melee, there are very many options of great capture cards to go for. Which one is the best depends mainly on whether you use a standard 480i TV, a 480p YPbPr CRT, a 480p VGA monitor or an HDMI gaming LCD, and on whether you want to use a laptop or a desktop computer with free PCIe slots. Here, the standard solution is the Blackmagic Intensity Shuttle USB3. It down-converts 480p YPbPr to 480i CVBS with minimal lag. As such, it is ideal for streamers who travel a lot and need compatibility with the – by far – most common type of Melee display, which are 480i CRT TVs. The things to keep in mind with this one is that it's only compatible with native Intel USB3 controllers (from Ivy Bridge (2012) and later mainboards) and with NEC/Renesas USB3 controllers. If you use any others, for example ASMedia ports that are often used on slightly older mainboards or on AMD motherboards, the video feed will either be unstable or not work entirely. If you use a desktop PC, this is easily remedied by buying a USB3 PCIe extension card for about 10$, just make sure it's specified with a NEC/Renesas controller. One downside of this setup is that the video stream for the players is only 480i-CVBS. However, if there is a Sony PVM or other CRT supporting 480p-YPbPr in the venue, you can use the Shuttle's YPbPr output to connect to that. Alternatively, you can also use a Mayflash VGA005 or an Extron CVC to convert the YPbPr output to VGA for compatibility with PC CRT monitors. For these, any capture card with YPbPr inputs is fine. A good card that has that and uses a USB2 port (for great compatibility with computers) is the Elgato Game Capture HD. Just keep in mind that you do need to buy a YPbPr distribution amplifier with an active power supply so there is no brightness loss on the recording / stream and the monitor. Another option is the StarTech PEXHDCAP card, which uses PCIe, and as such is only compatible with desktop PCs. It uses uncompressed video and thus has minimal delay (only about 30 ms), which is great for keeping commentator audio in sync with the gameplay. The PEXHDCAP (Yuan SC500) also requires a distribution amplifier. As listed at the end of the 480i section, the Blackmagic Intensity Shuttle also support 480p YPbPr output well, and even has active outputs, so there is no need for a distribution amplifier. A newer card USB3 is the Avemedia Live Gamer Extreme GC550. This card has been reviewed by TheThrillness to have great YPbPr capture quality. It has an active HDMI output that can be used both with HDMI and YPbPr input, so it's a great solution to go with a fast LCD monitor. It's a rather cheap card that supports 1080p60, so if you also stream newer games that accept this resolution, this might be a great solution. There are only a few capture cards that take VGA inputs. One of them is the StarTech PEXHDCAP (rebranded Yuan SC500), which is currently being phased out. It's a card with great drivers whereas usability is concerned, however there are some minor stability issues of the driver initialization. Earlier revisions of the card sometimes don't show up when booting the computer. Re-booting for up to four times has always fixed this for me so far, and with the newest drivers, it hasn't happened for me for a long time. When the card was properly initialized, there were never any problems, though, so I still highly recommend this card. There are three newer versions of this card: The PEXHDCAP2, which (according to StarTech) no longer has the initialization issues, but allows less freedom in the input configuration: While the original version had connectors for both audio, YPbPr and DVI-I (and thus VGA), the second version only has a single DVI-I connector. Through some of its pins, analog audio is accepted. With the supplied breakout cable, it's still possible to input YPbPr and even composite video together with analog audio, however if you use the supplied DVI-I to VGA adapter, the audio input pins are physically unavailable. I expect that this could be fixed by hand-crafting a DVI-I to VGA + RCA audio cable, but the required soldering is quite a bit of work. You could of course use your mainboard's audio input to record the game sound instead, however I found the quality of the StarTech sound to be significantly better than Realtek integrated audio, so I don't recommend that. If you go for this card revision and VGA capture, but don't want to craft cables yourself, another solution is to buy a sound card, for example the Asus Xonar DG (30$), which is quite good for the price. Then, there is the PEXHDCAP60L which compared to the original model also supports composite video and resolutions up to 1080p60. For Melee, this is irrelevant, but if you also stream other games like Smash 4, this can be very useful. There is a more expensive sub-version of the 60L, the Micomsoft SC512N1-L/DVI, that also has integrated distribution-amplified outputs for all its video inputs. It does not do cross-conversion for these, though, unlike the Blackmagic products. So if you input YPbPr, it will only be output as YPbPr, not as CVBS or VGA. The third newer version is the Micomsoft XCAPTURE-1, which also supports up to 1080p60, also has amplified outputs, but uses USB3 instead of PCIe. It's said to be less picky in the USB3 chipsets it communicates with than the BlackMagic Intensity Shuttle USB3. Can't speak about the PAL region, but a lot of CRT's were using component as an option here by the time the GC Component Cable was released. SCART just never remotely caught on here. We were fine with extra cable leads and Component was superior to SCART anyway. Glad we have one standard resolution and digital signal standard now though. Secondly, there was no GC VGA cable, what happened was the GC's Component Cable, which went through the "Digital Out" port despite being an analog connection, had a DAC in it. Literally, it converted a digital signal like that used by DVI and HDMI, into an analog one usable by Component cables. Essentially, the GC Component cables had a built-in DAC, probably why they were so expensive even at the time. As far as I know any GC VGA's are just modded Component Cables. I wouldn't recommend a Component to HDMI converter either, unnecessary lag. If you're playing Brawl just use a Wii U, and if you're playing Melee you're best off with Component and letting the TV do the work, it's not going to look any better, it depends on the quality of the Component cables before it gets to the HDMI converter regardless. Can't speak about the PAL region, but a lot of CRT's were using component as an option here by the time the GC Component Cable was released. SCART just never remotely caught on here. We were fine with extra cable leads. Many of those late “HD CRT TVs” have been reported to have considerable input lag due to some post-processing. Do you know whether that’s the case for the CRTs you are talking about? Secondly, there was no GC VGA cable, what happened was the GC's Component Cable, which went through the "Digital Out" port despite being an analog connection, had a DAC in it. Literally, it converted a digital signal like that used by DVI and HDMI, into an analog one usable by Component cables. Essentially, the GC Component cables had a built-in DAC. As far as I know any GC VGA's are just modded Component Cables. Yeah, they are. That’s what I said / implied in the paragraph just after the one you quoted. I forgot to explicitly state that the cables need to be modded, though, so I’ll edit that in. I googled around a bit and found one dude who’s into video quality on old gaming systems reporting that EDTVs are very hard to come by, even in North America. I don’t know much about those EDTVs as their equivalents (PALplus, which afaik didn’t support 480p60 so they’re useless for Melee) were even more scarce here in Europe, so it would be great if you or someone else could tell me more about them so I can update the OP. Was not aware RGB-SCART was actually better than Component, interesting. Nah, don't worry about them, they are quite rare but they certainly existed in North America, some of them weren't even labelled. Really they're just HD CRT's without HD. Could they have less input lag than an HD CRT that has to do upscaling? Possibly, but we're talking tiny, tiny amounts. Don't worry about EDTV's, and if you want to avoid input lag, don't worry about analog to HDMI converters. Its actually gotten to the point that I think I imagined EDTV's. I thrift A LOT and I see a lot of TV's and I still have yet to see a EDTV since the one my friend bought new in 06. I usually even go through the bother of if I see a newer looking crt i'll check the component input to see if 480P is labled. Hey, thanks for registering to add to this discussion! With the Gamecube, it’s even more complicated. Similarly to the Dreamcast, it has a way to output 480p RGBHV, but not with vanilla official cables. You need the official D-Terminal or YPbPr cables and re-solder some pins to make the DAC inside output RGBHV instead of YPbPr. Someone on gc-forever (so likely a Gamecube portable modder) told me that the Gamecube uses a YUY2 frame buffer and the YCbCr Digital AV output is said to be 4:2:2, so I suspect the RGBHV from the modded DAC cables will transmit 4:2:2 quality. I also don’t know how the YCbCr from the Gamecube Digital AV Out port does its sync handling; if YCbCr uses sync on Y (seems unlikely to me since it’s digital? ), RGBHV shouldn’t give any upgrade over YPbPr at all. The capture card I currently use (Yuan / Micomsoft / Star Tech SC-500N1) does give a better picture quality with RGBHV over DSUB-in, though. Might be due to better processing by the card on that input than for YPbPr, though. Oh wow!!! The man himself. EDTV's were rare and unnecessary, all I really remember about them. I guess it was always, why not get an HD CRT, right? Come to think of it though, I've never seen one in the wild either, not that I thrift much, but then again I don't see many HDTV's either. For OP, you can find modern HDTV's with input lag below 20 ms. I don't know how much using Composite or Component jacks and the TV thus upscaling the image would add to that, but if you're only concerned about input lag, not all modern HDTV's are that bad, especially in game mode. Below 20 ms is not something to be particularly proud of. I did not make this thread to find something for me, but to educate others. I’m perfectly happy with my lagless Sony GDM-F520 and PVM20M7MDE Trinitron monitors for Melee 480p gameplay and prefer them to LCDs, because with them I know that there is truly zero lag (well, 1µs or something, so yeah). are we only looking at lag issues or in general? what era of consoles? The two best displays I've personaaly ever owned were my SD Samsung slimfit CRT HDTV and my Sony BVM monitor. The slimfit was awsome. it was widescreen and could do up to 1080i. It had just about every input on it. RF, composite, S-video, component, HDMI and VGA. I had somthing like 20 consoles hooked up to it at once at one point via selector boxes HD looked good but it handled classic consoles suprisingly well. That said I still got some ghosting issues on games and some games gave weird effects if there was checkered backgrounds, I assume it was because of the lack of scanlines. I did by a RGB2+ upscaler for it at one point but I wasn't really impressed. Also if you set it side by side with a SDTV and played a classic console like the SNES you could then notice the blockyness but it honestly wasn't very bad. My 25 inch (?) Sony PVM from the 90's was OK. it was old and the colors weren't terribly bright but it was a decent monitor. it seemed a little washed out sometimes but I don't know if that was due to age and use or just how it was. As far as pre HD era gaming though my best monitor has to be my Sony BVM I picked up a few months ago. it does Composite, S-video, Component and 15khz RGB. it can do 480P so I guess that does make it EDTV. The picture is outstanding with the one downfall being its a tiny 14 inch screen. They make a 20 inch version I would love to get my hands on eventually. Amazing, amazing thread. Top notch. So, now I want to see how we can apply this knowledge to project #smashVault, and establish a standard that will carry itself for years to come. Right now, our Socal vault is three 24" Trinitron KV-24FS120s. Thats 480i max, but it has headphone jacks, and component. We're looking to get 40 TVs in total, ~4 of which will have to be the highest of quality, preferably 480p. They'd also have to play nicely with capture devices, as they'll be the main stage/stream stations. Due to the rarity of 480p setups, and how hard it is to verify it without a model number, I think we will be forced to use 480i standard for our off-stage ones. But we can have a little more flexibility with the stage setups, and be more selective with our pickups. Essentially, I want those 4 to be the best money can buy, with streaming and lag requirements in mind. Question is: what are they? Does RGB play nicely with capture devices? If so, which ones? Hi 0blivi0n! Thank you for joining the forum! We're a competitive gaming community; I run Team OXY, an organization which runs Smash Brothers tournaments. We have a partnership with Major League Gaming and Evolution Championship Series with which we'll supply them with our equipment. Equipment we're in the process of buying / gathering. So, this thread relates to that, as we're trying to get our hands on the best displays available. Our utmost priority is lag. If there is any, its unacceptable. Next, we have to have the TVs work well with N64 (Smash 64), Gamecube (Melee), and especially Wii systems (Melee, Brawl, Project M). We'll need headphone jacks (Trinitrons are great for this, since they have jacks on the front panel), or some alternative audio solution that will let players hear in-game sound through earbuds. And finally, since we have a livestream production with the gameplay, we also have to consider the capture devices interacting with it all. Essentially, I want those 4 to be the best money can buy, with streaming and lag requirements in mind. Question is: what are they? Does RGB play nicely with capture devices? If so, which ones? I’d say one setup should be a Sony PVM or BVM (one of the models listed within the OP) with 480p YPbPr in from a Wii and passthrough YPbPr to a Blackmagic Intensity Shuttle capture card that’s attached to a “desktop” PC with a Renesas/NEC USB3 PCIe extension board. Another one could be a PC monitor (Sony GDM-F520 or -FW900 would be best, the latter is widescreen) connected to a Gamecube with a VGA-mod cable. If you want to stream / record from this setup as well, you would have to get powered VGA splitters. Those should not lag, but I don’t have all of the necessary equipment yet to test it. The only cards I know of are the Star Tech PEXHDCAP (PCIe, 120$; available under other brands as well, but those are more expensive) and the Micomsoft XCAPTURE-1 (USB3, 280$). Both of these are made by the Taiwanese manufacturer Yuan and have pretty good quality. I personally own the PEXHDCAP / SC-500N1 and I really recommend it for VGA capture. Quality sample: https://archive.org/details/Vm14-5Sl2.teaVsDan60fps (sorry for the garbage stream overlays). That was YPbPr by the way; it looks a little bit better with VGA / RGBHV. Yeah, sounds like the elusive EDTV, which I didn't know were quite so uncommon until today. Yours sounds like it had the res of 1920x1080i though, I remember there were even HD CRT's that even skipped from 480p straight to 1080i in compatibility. Do you think the monitor can be fixed or should I ask for a refund/replacement for the ebay seller? Am I crazy or is this thread saying the Panasonic Q solves a lot of problems? Simultaneous analog outputs? He's running Composite on one TV and S-Video on the other, from the same Q! If that's the case, couldn't you pump an RGB/Component output into a capture card, and use another output (let's say S-Video) to your CRT? Am I crazy or is this thread saying the Panasonic Q solves a lot of problems? Simultaneous analog outputs? He's running Composite on one TV and S-Video on the other! You don’t need a Q for that. PAL Gamecubes output 480i over composite, component and RGB-SCART (>>S-Video) at the same time if you have the right cables. I suppose NTSC Gamecubes should be able to do the same with composite, S-Video and component as well. You do get 480p on unmodded Gamecubes, though. I’d trade the RGB-SCART capability for that. I’ll review it when I receive it. Also, I’ll make videos of my current setup today. I received it and did some testing. The dreaded occasional blacking out I had read about occurred when I plugged it to an LCD monitor, unfortunately. Every ~2m50s the picture will go black for 2-4 seconds. This is intolerable for tourney play. When I plugged it to my Sony GDM-F520 CRT monitor, this problem did not happen. The picture quality was excellent, just like Gamecube RGBHV. I also couldn’t feel any lag – the cable only does analog→analog conversion (YPbPr 4:2:2 → RGBHV), which shouldn’t introduce any lag. Recording seems to be a bit tricky. The VGA splitter I use for my Gamecube outputs only black when I plug the Wii VGA cable into it. Maybe other VGA splitters work, but I won’t spend money on the mas I personally have no use for them. Some things I've found. I didn't realize the different between coaxial and RCA cables before, and what they're capable of transmitting. It's interesting. RF signal is indeed "the worst." However, apparently a composite signal can also be communicated over a coaxial cable, as well as an RCA cable. Also, I didn't realize coaxial refers to the cable, while RCA refers to the cable connector. -RCA is the name of the connector at the end of the simple cable. The simple cable can carry Composite or part of the Component video, or even audio, but the cable itself is capable of carrying these signals, RCA is the name of the connector at the end. -Coaxial is the name of the cable. In turn, often what we see is an "n connector" on the backs of TVs and on coaxial cables. Professional studios may use any number of different coaxial connectors, but the key difference is that coaxial defines the type of cable but coaxial cables can come in differing degrees of quality, from what I understand, based on their level of shielding and impedance or whichever. Cables used with RCA connectors can differ as well but most seem about the same to me I think heh. -Composite video can be transmitted by both a coaxial cable and a "normal" cable with an RCA connector; therefore, if you're splitting composite video to either coaxial or RCA, the signal should theoretically be the same, but practically, the coaxial cable should have more to worry about due to its design (interference or decoding both the audio and the video signals and what not), so it may end up providing a worse signal than an RCA cable. but... I guess I'm writing it out if anyone else is interested. -Composite video combines the chroma and luma properties of the video into one signal. This combining or multiplexing of the signal is what contributes to dot crawl (since it can be difficult to separate upon receiving the signal), thus our specific need for comb filters in composite-in CRTs. -S-video separates the luma from the chroma but doesn't distinguish between the parts of the chroma, giving two signals. Thus "Separated"-video. -Component segregates the luma and then separates the chroma into two parts (red/blue) and then derives the difference for the third value (green) upon receiving the signal, allowing bandwidth to be conserved by not transmitting the green signal separately and such. Technically, RGB is "component video" as well but most often "component" refers specifically to YPbPr/YCbCr color signals and not the componential RGB signals. The details of color signal are beyond anything we'd care about here but in lay terms the difference between YPbPr and YCbCr is that P refers to analog while C refers to digital; Y is the luma, b is the difference in signal for blue, and r is the difference for red (green is derived afterward), and the color values broadcasted between the analog and digital versions of the signal are numerically the same (naturally), except that one is susceptible to analog interference (the YPbPr signal) . It's been said that the Wii outputs in analog YPbPr while the GameCube natively outputs to YCbCr, the digital version, which is then immediately converted to analog using the DAC circuit in the cable - an extremely high quality converter, I hear. Kadano responds to some of this in his post below. -RGB 'component' is "superior" to YPbPr/YCbCr 'component' in that RBG signal transmits each chroma value separately in addition to the luma, allowing the full signals to be communicated and no interference or signal-loss to occur, which may happen slightly with YPbPr/component video. Kadano has more to say about this in his post above and below this one. I feel more comfortable leaving this to Kadano's post below. Its actually gotten to the point that I think I imagined EDTV's. I think I've seen two. Such a short-lived phase. Also one of the other benefits of EDTVs is that they were built widescreen, so they natively supported 16:9 aspect. Was it actually 1080i or was it just downscaling to 720p? If I'm remembering correctly, those CRTs were just marketed as displaying 1080i even though CRTs could display a multitude of resolutions/framerates (with limits - like 1080i60). Also, 1080i could be weird depending on your source - some cases of 1080i were actually upscaled 720p that had half the frames dropped, and some 720p were downscaled and deinterlaced 1080i. Obsolete debate though. I didn’t go into the differences and advantages of the various output signals and just listed them by quality because this thread is, in the end, only about the very best ones. RF signal is indeed "the worst." However, just because a signal is communicated over a coaxial cable doesn't mean it's worse than a signal transmitted through an RCA cable. Well, after all, composite video (CVBS) is bad because all color information is combined in a single line. Audio is sent in separate stereo, though. RF combines the CVBS and the stereo audio to a single AV line. Considering how S-Video looks superior to CVBS, with the only difference that the color information is separated in luma and chroma for S-Video, I think it’s pretty obvious that the modulation of both CVBS and stereo audio in RF cables has to deteriorate both audio and video quality. Yeah, I was going to say, I remember reading that PAL had a slightly better color quality (RGB) than NTSC (YPbPr/YCbCr), and I think this is due to the PAL standards. RGB-SCART is the best widely-used output mode in PAL regions, yes, but it’s not superior to YPbPr in every way. RGB-SCART has its video information separated into 4 lanes (RGBs; red, green, blue and composite sync) while YPbPr has its video information separated into 3 lanes (YsPbPr; 1 channel for luma and composite sync, 2 channels for chroma). While SCART’s 4 video lanes are somewhat superior, composite sync requires very little bandwidth and I’m pretty sure that the video quality is not affected by its modulation to Y in a perceivable / measurable way. YPbPr supports 480p by default. While SCART would be able to do this in theory, it’s never been defined as a standard and only very few devices support 480p (31khz) SCART. 480p is definitely a more important advantage than the theoretical color advantage RGB has over YPbPr. Thus, the difference between the GC's DAC cable and just a straight-up VGA/SCART modification for/version of that cable is near-none, but the Wii lacks this quality of digital-analog conversion ("DAC"), thus producing a less-clear picture than the GC. Except for the obvious animation differences due to not being synced, they appear perfectly even in quality to me. -RGB 'component' is superior to YPbPr/YCbCr 'component' in that RBG signal transmits each chroma value separately in addition to the luma, allowing the full signals to be communicated and no interference or signal-loss to occur, which happens slightly with YPbPr/component video. This is most often accomplished through VGA or SCART-type connectors, which use a different cable than that used with RCA connectors, the cable used for your normal "component" type video. The GC component cable basically takes care of this problem, though. As for your references, while the Gamecube article seems great, the GC vs. Wii picture seems way off. I own a multi-sync Sony PVM20M7MDE that displays 480p60 YPbPr, and it looks really great with both GC and Wii YPbPr cables. If there was such extreme artifacting as in the screenshot, I definitely would have noticed. Also, in that picture, they don’t even say what kind of video signal they compared. Not too reliable imho. The GC natively outputs a digital component signal (YCbCr) while the Wii outputs an analog component signal (YPbPr), which is susceptible to interference through transmission or upon decoding the signal. Thus for component output, GC > Wii, but this is only really because of the extremely high quality of the DAC in the GC cable (or so I hear). Again, I don’t agree that GC YPbPr > Wii YPbPr and think that this is misinformation. Large graphical CRT PC monitors plus separate, dedicated speakers, GC DAC cables modded for RGBHV/VGA output and an active VGA splitters are the setup that fares by far the best in these that I know of. Thanks for your reply my post has been edited. I'll go with that. Sorry, from some of my reading it sounded like coaxial (professional level) could be better than RCA cables, but I realize the cables we're using may probably perform worse than the RCA we're using - anyway, I couldn't confirm it either way so I should have written my statement with that in mind. Ok. Your pictures look identical to me. This makes sense. I didn't know there was a 4:4:4/4:2:2 difference there. I'm still unfamiliar with that thing but I get the conceptual gist of subsampling. Mr. High-roller over here, dedicated speakers... alright alright. BenQ RL2455HM (the predecessor had a latency of 4.2ms). This has been reported to work with YPbPr / sync on green on the VGA input, so you only need a passive adapter for 3$ and Wii component cables. I don’t know whether the Asus monitors support this as well. Considering getting started with a Sony PVM-14L5. My cheapest option here would be to get a Wii with component cables to play in 480p? I'd also need some converters for the cables themselves, right? And external speakers? Sorry for the lack of technical knowledge. Sony PVMs have in-built speakers. Note that the 14L5 is a bit small (14"), it might be considered too small for teams by some players. You need 3 RCA female to BNC male adapters. Six if you want to be able to record / stream as well. I bought them for 50 cents or something each. Does that model have video out, too? I was using splitters to record on a very cheap dazzle and the crt would darken considerably. Is there a quality loss for players while streaming? Does that model have video out, too? I was using splitters to record on a very cheap dazzle and the crt would darken considerably. Is there a quality loss for players while streaming? If you use unpowered (passive) splitters, yes. If you use distribution amplifiers like the PVMs have, there is no image quality loss at all. Is it a mono speaker? It looks like there's only one audio input there. Yes, as far as I know, all PVMs are mono audio. Really good thread. I'm something of an A/V nut for retro games, so this topic is right up my alley. You should be able to see that the Wii output is slightly noisier in general, especially on the color bleed test. The capture process is the same for both consoles. I certainly wouldn't say that it justifies the $100+ premium for most consumers, but the difference is there. For Brawl / Project M, I substitute a Wii w/ D-terminal cables. The XRGB / VGA combo is sublime. I'd be willing to bet that the only thing that possibly beats it is a 480p PVM monitor. 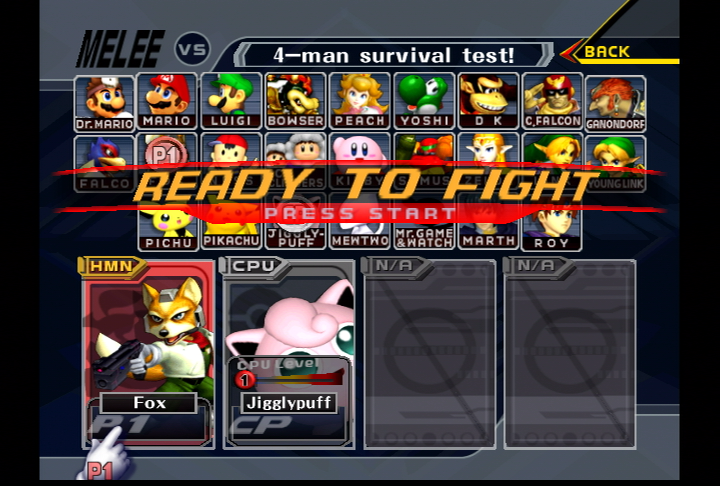 Probably a stupid quesiton, but is there any problem with just playing Melee on the first gen Wii's? Does it have to be on a gamecube? Didn't Wii's have their own composite cables? I remember buying an official Nintendo one whenI first bought my Wii in 2008. I'm not sure how the Wii's backward's compatibility works with Gamecube, but do tournaments not allow Melee to be played on Wii? It has to be on a gamecube? Thanks, I’ve included that information and your post within the OP. I’ve listed the Wii cables below the Gamecube ones now. Have you managed to get the XCAPTURE-1 to use the correct color encoding? I remember TheThrillness showing that it uses BT.701 instead of BT.621 or something like that. If I’m not mistaken, it defaults to a different standard than Gamecubes and Wiis output, which results in ever-so-slightly off colors (too little blue to my perception). Also, what exactly is the XRGB-3‘s purpose in this device chain? Does it convert YPbPr to RGBHV and upscale from 480p to 960p? I use Gamecube RGBHV-modded DAC cables, an Extron distribution-amp with four outputs and StarTech PEXHDCAP for recording and three CRTs (currently Sony GDM-F520, Mitsubishi DiamondTron 2070SB and Philips 109MP) for playing. Well, like Sixfortyfive just explained, Wiis have worse video signal. Composite cables are the worst and very far from a “perfect setup”. Playing in 480p and with less than 1 microsecond lag are the requirements I define as a perfect setup. You can use Wiis for that, but you need component cables and a Sony PVM-20L5 or 20M7MDE. Altogether, Gamecubes are simply better and can be used with much cheaper (yet same picture quality / amount of lag) CRTs even when recording / streaming. ideo signal. Composite cables are the worst and very far from a “perfect setup”. I had it backwards. I was referring to the Wii's Component Cables. Composite is usually Yell-Whi-Red right? I meant the 5 input Component, which I think includes Green and Blue as well. Gamecube out to >> Projector for the audience, Line to Capture Card, plus Line to the TV the players are playing on? What about the original Wii? What's the best possible set up or 2nd best possible set up for that? I'm going to be running a tournament in a few months and if I can't get my hands on Gamecubes, I have friends who have Wii's that haven't been touched for almost 5-6 years. So I can just buy theirs off their hands for dirt cheap or even free and that would be my backup plan. I personally have an original 2001 Gamecube, but I don't want to use it that much just for my personal sentimental reasons haha. In most circumstances, there's no practical issues running Melee on Wiis instead of Gamecubes if that's what you have. Gamecubes are simply more convenient because you don't need Wii Remotes to navigate the menu and start the game. Gamecube component cables are slightly higher quality, but Wii component cables are much cheaper and far easier to find. It actually *doesn't* seem to be an issue at all for the Gamecube/Wii. Check the color bar test in the previous link I posted and you'll notice that every single shade of color is distinct and that the sampled colors range from 0 to about 250 on average, which is close to full range (0-255) with no apparent black/white crush or washed out colors. You can compare the captured images to the source file if you want to really evaluate how well the card's color sampling fares in this case.